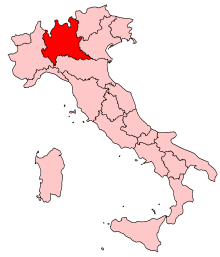 Lombardy (Lombardia) is a land-locked region in northern Italy. Milan is the capital of the region and it is recognized as a world fashion and design capital. 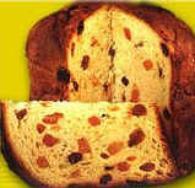 The city is home to numerous famous dishes, such as panettone and Osso Buco alla Milanese. Alpine peaks surround the northern part of Lombardy, so winters are long and not optimal conditions for growing fruits and vegetables. The fertile soil, sunny days, and cool nights combine to facilitate the growth of hardy vegetables such as potatoes, cabbage, and radicchio. 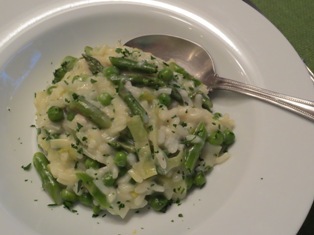 Rice is very popular throughout the region, and risottos are often preferred to pasta; although gnocchi are very common in Lombardy. 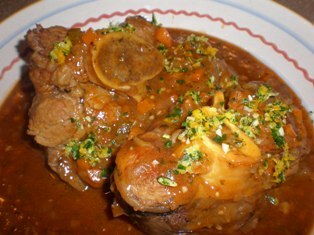 Single pot dishes, which take less work to prepare, are popular. Farmers raise animals that thrive in high altitudes and cheese made from their milk is a staple. 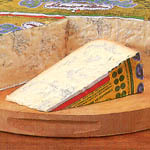 Each mountain region and often each valley has its own cheese varieties. Buckwheat or grano saraceno has always had a place in mountain cuisine where the land is less fertile. Although buckwheat is commonly used as a grain, it is actually a fruit seed that is related to rhubarb making it a suitable substitute for people who are sensitive to wheat or other grains that contain protein glutens. Buckwheat is available in 3 forms: groats, flour, and noodles. The flour adds an earthy flavor to pasta, crepes, and pancakes. Buckwheat’s hearty nuttiness is especially satisfying in winter. For more information on dough recipes, rolling and cutting pasta, and cooking pasta. 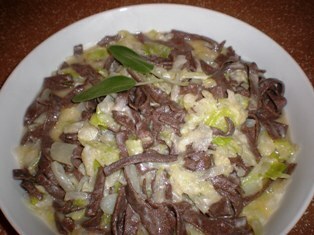 Pizzoccheri, which is a type of tagliatelle, is a favorite pasta of northern Lombardy. It is made with 2/3 buckwheat flour to 1/3 wheat flour. Since buckwheat flour lacks gluten, the wheat flour is needed to provide gluten which is necessary to hold the dough together. Valtellina, a valley in the Lombardy region of northern Italy, is one of the last remaining places in Italy where buckwheat still grows. An excellent way to enjoy pizzoccheri is in a gratin-style dish with cabbage, potatoes, sage, and an Alpine cheese such as bitto or fontina. Combine the 2 flours in a bowl with salt. Add the egg and mix it into the flour. Add the milk, mixing until you have a soft dough. You may need more or less milk depending on the dryness of the flour. Knead the dough a few minutes until smooth and elastic. Allow to rest for 1 hour. 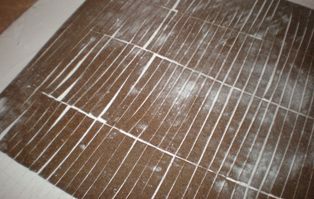 Using a pasta machine or rolling pin, roll the dough out thinly and cut into noodles 1/4-inch wide. Cut the noodles into 3 to 4-inch lengths. Cook the cabbage and potatoes in boiling salted water for about 5 minutes, or until potatoes are tender. Add the pizzoccheri (noodles) and cook 2 more minutes. Drain and reserve 1 cup of cooking water. Heat the oil in a large skillet and saute the sage and garlic for 1 minute. Add the cabbage mixture and shredded cheese; season with salt and pepper. Gently stir to combine and melt the cheese. Add reserved pasta water if the mixture is too thick. NOTE: You can purchase buckwheat flour online or at natural food and specialty stores. If you don't have the time to made homemade buckwheat noodles, substitute fresh egg or whole wheat fettuccine. If you use dried pasta, remember that it needs to be cooked longer than fresh pasta. 'Bitto' is an Alpine cheese used in a lot of dishes, such as Pizzoccheri, in the Valtellina valley of Lombardy. The cheese is named after the stream Bitto which flows into the Adda River. It is made from whole cows' milk with a small portion of goat's milk, which makes for a stronger taste.The curd is cooked, molded, and salted, and then ripened for 3 to 6 months in cool conditions. The ripening time can be an entire year if the cheese is intended for grating. The texture of a young bitto is fine, but becomes dense and more crumbly as it ages, intensifying the flavor. Lombardy is the birthplace of mascarpone and gorgonzola. These two rich cheeses in addition to fontina and Parmigiano provide a creamy pasta dish. We recommend gemelli pasta but you can substitute penne, farfalle, or rotelli. See our Italian Cheese Guide for more information on the cheeses in this recipe. Heat the oil in a large skillet over medium-high heat. Add the shallot and asparagus; cook for 2 minutes. Add the wine and bring to a boil. Cook until the wine is evaporated, about 3 minutes. Add the cream and a pinch of salt. Bring to a boil and then reduce to low. Add the fontina and gorgonzola cheeses. Cook until the sauce is thick, about 5 minutes. In the meantime, cook the pasta until al dente. Drain the pasta and add it to the cheese sauce. Stir in the mascarpone and Parmesan cheeses. Sprinkle with freshly ground black pepper and serve. months; the longer the aging the stronger the flavor. Gorgonzola's flavor can range from very mild (dolce) to extremely strong (piccante). Several varieties of winter squash are grown in Italy, especially in Lombardy, the Veneto, Emilia-Romagna, Puglia, and Campania. The squash are used to make risotto, added to soups, or fried. These slightly sweet ravioli are accented with the almond flavor of amaretti cookies. Preheat oven to 400 degrees F. Grease a small baking pan. Cut the squash in half; scoop out the seeds and fibers. Place the halves, cut side down, in the pan. Bake 1 hour or until tender when pierced with a fork. Cool. Scrape the flesh from the skin of the sqash. Puree the flesh in a food processor or blender until smooth. Stir in 3/4 cup of Parmesan, the amaretti, egg, nutmeg, and season with salt. Make and cook the ravioli as described in Make and Form the Ravioli. While the ravioli are cooking, melt the butter in a saucepan over medium heat. Pour half of the butter into a serving bowl. Add the ravioli and the remaining butter. Add the almonds and gently toss. Sprinkle the ravioli with the remaining Parmesan cheese. Serve. 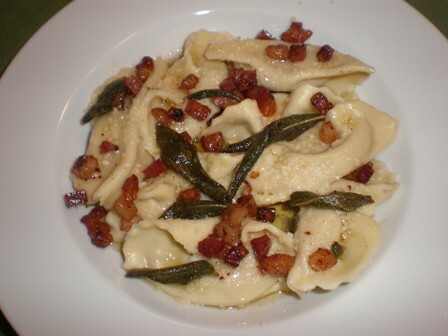 Casoncelli (pronouced ka-ZONE-chelli) are made with fresh pasta dough that envelopes a slightly sweet meat filling and are typically served with melted butter flavored with pancetta and sage leaves. They come from the area in Lombardy called Bergamo. Casoncelli in the style alla bergamasca are filled with a variety of stuffings. There might be a single type of meat or a mixture of meat (ground beef, pork, veal, sausage, or salami) and then a combination of other ingredients may be added, such as cheese, spinach, raisins, amaretti cookies, pear, or garlic. GREATBIGCANVAS Gallery-Wrapped Canvas Entitled Interior of Varenna Caffe on Waterfront in Varenna, Lake Como, Lombardy, Italy by 48"x38"